Body War Nutrition is a still a relatively new company and BodyShred is their first product. Having been reformulated in recent months, this fat burner still has an impressive list of ingredients. Of the many fat loss components packed into this ultra concentrated powder, a good proportion of those are stimulants, so this product is definitely not for the faint-hearted. Let’s take a further look at the product and what sets it apart. BodyShred contains ingredients that promote fat loss in a variety of ways, and fans of nature-derived ingredients will be impressed. Thermogenic ingredients like Raspberry Ketones, Green Tea Extract and Bitter Orange (Citrus aurantium) sit alongside stimulants like Caffeine and Bitter Orange Extract, and natural pick me ups like N-Acetyl L-Tyrosine and N-methylpentyl-iminoglutaric Acid. Tried and true ingredients like L-carnitine, Caffeine and Taurine are combined with newer supplements like Garcinia cambogia, Green Coffee Bean and African Mango, which are thought to work in novel ways to disrupt fat uptake and metabolism. 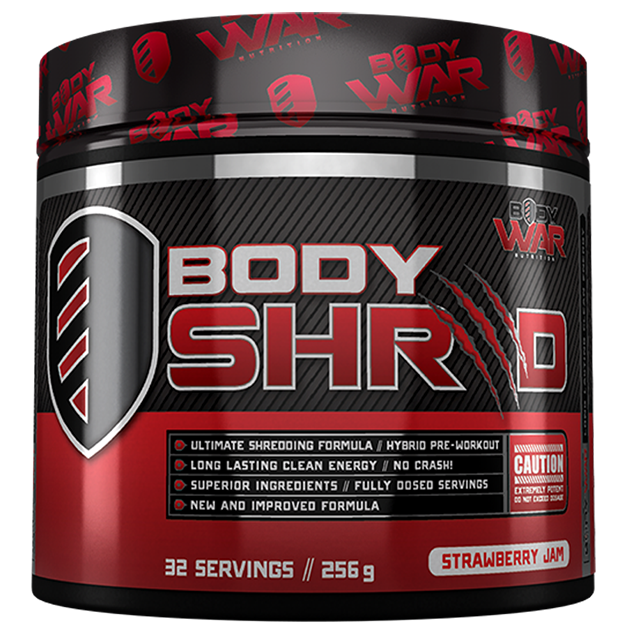 BodyWar have made an impressive debut with BodyShred, and what really stands out is the exciting list of ingredients. As detailed above, this product is a great mix of both the new and the classic. BodyWar have clearly been keeping up with changes within the supplement industry and have removed some of the stimulants which were in question such as Acacia rigidula and N-methyl tyramine. Instead, they have kept with traditional, but still very effective stimulants such as caffeine and bitter orange extract. This is a cleverly designed product because many of the ingredients have different, and complimentary modes of action. Thermogenic compounds like Green Tea and Bitter Orange are thought to speed the metabolism while stimulants like Caffeine help to suppress the appetite and lift mood. Ingredients such as African Mango and Garcinia cambogia may work on specific enzymes in the fat storage pathways, and Green Coffee and Taurine are thought to target carbohydrate metabolism. There is also some evidence of synergistic actions between compounds - Raspberry Ketones for example, are known to work well with stimulants. The addition of Horsetail and Celery Seed also help to limit water retention. BodyShred is truly an all-rounder fat loss supplement. The versatility of this product is also a big plus. For those who like a stimulating pre-workout, BodyShred could be a great option. It also provides the strength and muscle protective benefits of Taurine, while L-Carnitine may decrease lactic acid levels and is great for reducing muscle soreness in recovery. Certain ingredients in this product have the potential to interact with commonly prescribed drugs. Bitter Orange, like grapefruit, may interact with a large number of drugs, including statins (cholesterol medication) and over the counter painkillers. If in any doubt, it is best to check with a doctor before taking BodyShred, or any new supplement. If you're new to fat burners this may not be the product to start with. With a strong dose of stimulant ingredients, there will be a definite buzz associated with BodyShred. The manufacturer suggests starting with a lower dose and working your way up to a dose that feels comfortable. This product currently comes in three delicious sounding flavours including Strawberry Jam, Fairy Floss and Mango Punch. With only a very slight bitterness that is disguised by the distinct flavours, it is easy to drink and mixes extremely well. Still a potent and strong product, Body Shred is ideal for seasoned shredders looking for a strong kick to their fat burner. As their flagship supplement, Body War’s Body Shred is still one of their best offerings and certainly ranks extremely well between their competitors. It’s use of topical and transparently dosed ingredients is something to admire and they’ve definitely kept up to date with the science and the industry.